The best part about traveling is the freedom to explore your destination as much as possible. It is only through walking that you are able to enjoy the serenity of a new city, the countryside, and just about anywhere you can go on foot. When drafting your itinerary of how you plan on spending your time as you travel, finding the right shoes for you is one of the toughest tasks. Out of the tons of walking and traveling shoes available, you have to find the pair that balances comfort, style, and affordability. Walking for long hours with uncomfortable shoes with little or no support is a sure way of getting blood blisters and tiring your heels. As a fashion-conscious traveler, I have prepared you this list of the best walking shoes for travel. I hope it solves your conundrum of always spending too much time deciding on the best shoes to wear. This shoe brand features a rubber sole, which increases shoe traction in case the terrain becomes slippery. At the same time, the rubber sole acts as an excellent cushioning system against the foot impacts with the walking surface. Apart from the rubber sole, sock liners inside these shoes also have shock absorbing properties. You will, therefore, be kept comfortable throughout the entire duration that you will be traveling and walking. It is available in a stylish looking dark brown suede finish for the fashion oriented travelers. Various sizes of the shoes are available, just in case you are looking for a specific shoe size. An easy “slip in and off” design saves you from the hassle of having to deal with shoelaces. Its upper mesh allows for breathability when you walk for long hours. Regardless of their high rating, these walking shoes still do not cut it for some users. First, the width tends to be narrow, especially for those with wide feet. Secondly, there are reports of the shoes falling apart after a while. Even gluing the front tabs seems not to rectify the defects. 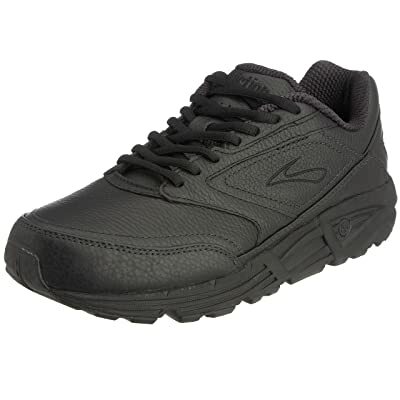 These walking shoes provide you with excellent versatility. Their usage does not only stop at being comfortable and well cushioned for long distance walks. You can as well use these shoes for athletic purposes, and even go to work in them. About 17 color choices are available for these particular shoes. This means that every lady out there is covered in terms of style. Alongside the colors, over 10 different medium shoe sizes are available. This variety covers just about everyone. Increments of 0.5 from size 5 are availed. A textile material is used in the design of the shoe upper. This design makes the shoes highly breathable for comfort during long walks on a sunny day. An elastic topline is great for ensuring fit. A latex arch insert and an insole made from pigskin give the shock absorbing properties. For these walking shoes, sometimes getting your preferred color and size might not be possible. An example is navy-fuchsia for size 10. You then have to order another color of the same size. There are also instances where users developed blisters after wearing them for a while. For travelers who intend to go to a warm-weather destination, these highly breathable walking shoes are ideal. A “slip on feature” in addition to its elastic collar and fixed pull loop laces create a snug, comfortable fit that you would wish for on a warm weather. Whether you are going traveling on a beach, or to a park, you can trust in these shoes to keep you going for as long as you would love to. The impacts resulting from your feet coming into contact with the ground are nullified by the rubber sole. Its pull loop feature enables you to fit the exact shoe size. There is no need to either size up or down for the right snug fit. The shoe upper is made from a canvas material which is both comfortable and durable. These shoes run a bit small. So, if your feet aren’t narrow, then you might want to size them down, maybe half a size smaller than your usual size. Since they are narrow, you might feel too tight wearing these shoes. Featuring a sturdy and sporty construction, the KEEN Women’s Presidio shoes provide an impressive blend of versatility and breathability. For traveling and walking, the supportive midsole and its well-cushioned footbed offer great toe to heel comfort. These shoes can be worn on a daily basis, and not just when traveling. You can run daily errands and enjoy weekend adventures as well. The shoe upper is made from water-resistant, long-lasting nubuck leather. These combine to give you a stylish casual look. Since these shoes are made from leather, you might think they heat up after a while. However, leather linings inside the shoes keep air flowing inside for breathability. If you intend to go for a long adventure, you can count on the removable metatomical, contoured foot bed for arch support. If you have been using the previous versions of this shoe brand, then you might notice a slight change in fit. I have found this pair slightly uncomforting, particularly the tongue. It’s thin and relatively long. In addition, shoe surface area seems reduced and so is the shoe balance. Who said you can’t go traveling in style and still hit the rough terrains for an adventure of a lifetime? This shoe brand features a classic styling with a mantra for a luxurious foot comfort. The construction combines both textile and leather materials for breathability and durability. I love the classic rubber outsole. It gives the shoes flexibility, cuts down on weight, and gives them impeccable traction when going off-road. This particular product has a medium taupe multi-suede finish. There are other 14 styling configurations to select from. A combination of a durable outsole and a removable insole creates an impressively versatile shoe. You can go walking in these shoes, work for long hours in these shoes and travel in comfort. However, if you have pronation issues, then I think these shoes might not work for you. If you have pronation issues then it is not advisable to wear these shoes for long hours. The inner sole tends to be high, which is not always good for those with pronation issues. Comfort levels are also lower in comparison with previous versions. 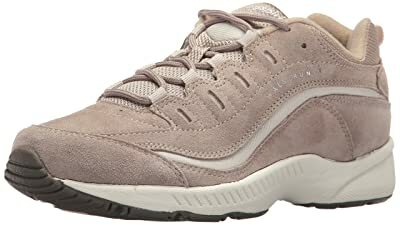 For classy, uniquely designed, and all-age group suitability shoes, I would recommend the Skechers Go Walk 2. The shock absorbing capabilities of these shoes are great; thanks to a Resalyte midsole that uses special injection molded compounds. Better still; an OrthoLite anti-microbial sock liner keeps your feet from developing rashes in case you have a sensitive skin. Do you want hi-tech shoes? Well, I find the fatigue detection sensors quite catchy. These GOimpulse sensors make it known to you when you are over-exerting yourself. The Shoes’ uppers are graced by heathered jersey fabric which makes it blend with your everyday shoe wear demands. Weighing just about 3 pounds, they don’t weigh you during walks. A highly breathable mesh is engineered for toes play and good foot support. Wearing these shoes if you are going to stand for about 9 hours at work might not be a good idea. Well, it is probably not the reason you want to buy them, but I appreciate a good value for my money. It would be great if you could wear them to work that demands standing. I am a huge fan of these boat shoes. 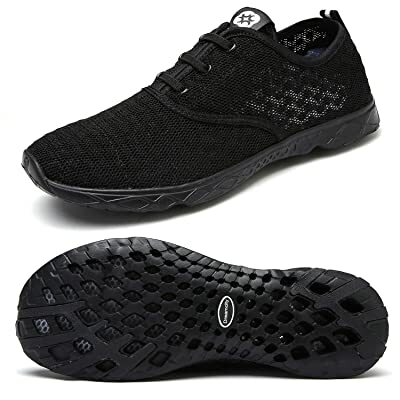 Its manufacturer, Skechers, has a huge reputation for producing high quality walking shoes. Available in size increments of 0.5 from 5M to 11W, it is a product for a range of travel-walking enthusiasts. Inside the shoes are Goga Max high rebound insoles from Skechers. These are great at providing comfort when the shoes are worn. In addition, they feature a lightweight, responsive 5Gnen cushioning system. It handles most of what a terrain can throw at it. The stylish canvas upper is available in choices of navy, red, and natural colors. You are; therefore, free to choose any depending on your wardrobe styling. For durability purposes, the sole is made from synthetic materials. It makes the shoes withstand hours of trekking without feeling fatigued. As a stylish traveler who appreciates a good number of color combinations, these shoes fall short for this purpose. I only find about three color options to select from. When buying, it is best to choose a larger size, as the exact size is too tight. I always have a liking for slip-on shoes. They eliminate the inconvenience of having to deal with shoelaces which can be quite annoying at times. Response mechanisms are impressive, making it possible to tread on an endless number of surfaces. With its unique GOimpulse sensors, you get instant feedback as you trod along any beaten or unbeaten paths. On the inside, an OrthoLite insole has anti-microbial properties which aim at inhibiting odor. A lightweight construction propels you instead of weighing you down. Cushioning mechanisms consist of RESALYTE cushioning. It uses a combination of materials to offer compound protection from impacts with the ground. Slightly thick, it’s still lightweight and doesn’t compromise on the responsiveness of the shoes. I don’t know why, but Skechers walking shoes do not fit well for people with narrow feet. If you usually don’t wear socks, then you should when you buy them. Some pairs come in hard plastic soles instead of the usual rubber. Traction becomes an issue in this case. 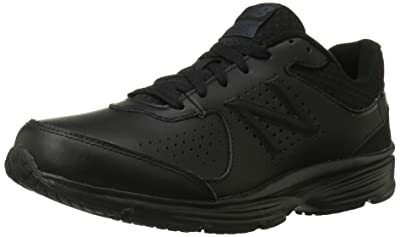 If you require medium to extra-wide walking shoes, then the New Balance MW411 V2 comes highly recommended. Although these shoes are predominantly made for athletes, they can still function as everyday walking shoes. These walking shoes feature laces that you can tie or loosen up, depending on the degree of fit you desire. A rubber sole on each shoe smoothens out rough patches as it makes your landings softer on your feet. Perforations in the upper mesh permit free flow of air, helping keep your feet from sweating. A plethora of sizes are available, ranging from the standard shoe size to extra wide options. I have a couple of friends with this brand of shoes and they all agree that it fits really well. Shoes running large like this one are a challenge to find your specific size, more so when not provided by the manufacturer. You, therefore, have to choose a smaller size for a snug fit. Durability is also another concern. The seams are susceptible to wear after a while of usage. Chances are that Skechers was the first brand of shoes you bought or got as a gift. These shoes are popular, whether it is for men or women due to their well-padded construction. Memory foam padding in the heel area creates a custom fit of some kind. 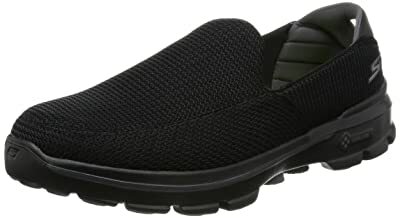 The Skechers lightweight walking shoes have a slip-on a feature for user convenience. 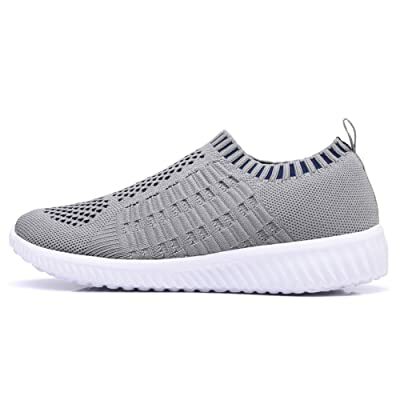 A meshed upper increases airflow within the shoees while a Goga mat insole extends the whole length of the shoes. Goga Pillars sole on the shoes is durable, shock absorbent, and generates good traction. I would recommend it to those who normally prefer a 1.5” sized heels. A fabric trim on the shoe and its cushioned footbed pamper your feet almost the whole day that you spend outdoors. Although you can wear these shoes without socks, having socks on fills the gap left as the shoes run large. Because the width is made a little large, those with narrow feet realize some looseness in the fit. Arch support provided is also not that great as you would wish in a walking shoe. These shoes start to wear down pretty fast after making a purchase. 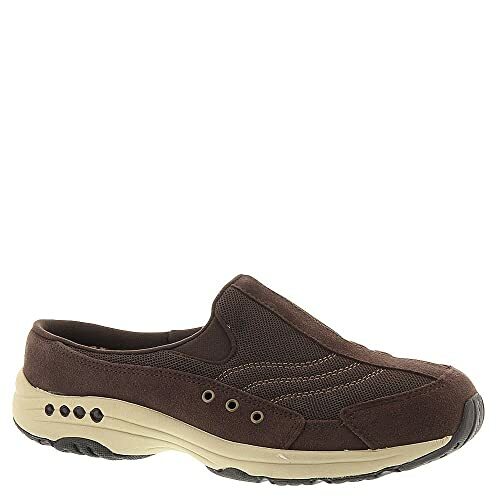 In terms of soft materials, the Rockport Eureka walking shoes perform quite well. 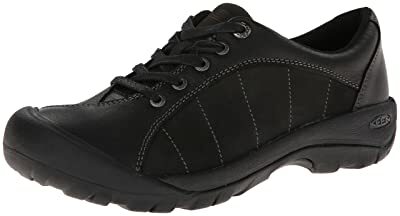 Boasting of genuine leather construction, flexibility in all directions, and a secure ride, this shoe brand has most of the features you would expect great walking shoes to have. It doesn’t matter whether you are using these stylish casual shoes for everyday use, traveling, or taking a stroll in a lavish countryside. You’ll still benefit from the San Crispino type of construction that gives it heel stability, a generous collar, and forefoot flexibility. An interior padding, as well as fully grained leather upper makes the shoes feel like you could be in them all day and not tire. Rubberized shoe sole cushions your every step while giving it a sure grip of the ground you are walking on. One drawback in these walking shoes for travel is their tendency to degrade in quality with time. In the process, you don’t get your money’s value and worth. The most susceptible part of the shoes is their soles which separate from the rest of the shoes. A blend of meshed and suede build gives the New Balance MW877 a classic look that has been a favorite among a lot of people. Seamless New Balance logos on its side help in distinguishing it from counterfeit shoes. 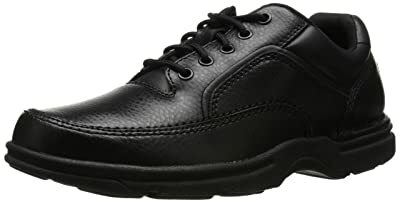 Both the collar and tongue of these shoes have a cozy padding that makes it feel very comfortable even when you have them on during a long hours shift. Moreover, the collar, laced front, and tongue create the custom snug fit that’s a requirement on walking shoes. ABZORB technology infused in the midsole adds to the cushioning feeling of the shoes. Some users claim that it makes you feel like “walking on air”. I wish I could try them on and confirm the validity of their claims. In as much as men are always disinterested in color choices of their shoes, you might not be pleased by the single grey color that this one comes in. The toe box is also sacrificed albeit for a slightly comfortable mesh upper. Do you intend to visit a place with wet and slippery conditions? If yes, then these Dreamcity men’s water shoes are what you need. To enable this capability, the shoe is fitted with water grip outsole. It’s a technique that provides adequate traction in slippery and wet conditions. And since you’ll be in wet, moist conditions, there is every need for your feet to stay dry throughout. A ComforDry feature creates a healthier, drier, and cooler shoe internal environment than in other standard shoe designs. At the same time, an open mesh upper together with engineered holes infused in the sole adds breathability to the shoes. Lightweight Solyte midsole contribute to the overall low weight of the shoes without compromising on the bounce back properties of the shoes. I have actually tried wearing these shoes for a trip in a wet, slippery terrain. I didn’t have the best of outings as mud and small rocks stuck inside the holes on the soles. It makes for a very uncomfortable walk especially when you have tired legs. 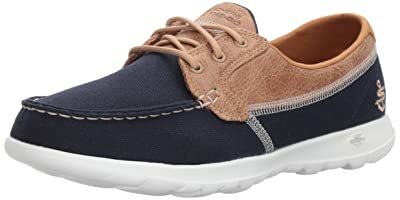 The Sperry Top-Sider Men’s Boat Shoes are some of the most popular walking shoes ever produced. An old-school leather look and an accompanying 2 eye laces system makes it a favorite for most men who do not have time to pass the lace through endless eyelets. The heel cup part of the shoe has an ethylene vinyl acetate material. It’s a material that offers excellent shock absorbing properties, more so when walking in bumpy terrains. Tru-Moc construction is hand-sewn to perfection, making the shoe both comfortable and long-lasting. Another great feature about these shoes is their non-marking outsoles. These outsoles are made from rubber, which is good when you need adequate traction in either dry or wet conditions. A razor-cut wave sipping outline on the soles channels water away from your underfoot. The option with the white soles requires a lot of effort from you to keep clean. This white edge turns grey if you leave the sole not cleaned for a long period of time. Its inner sole is a little problematic too as it comes off at times. 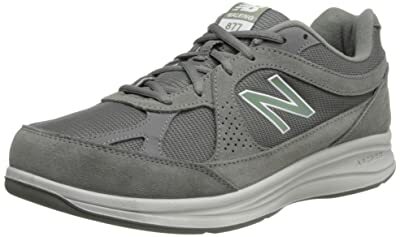 In my opinion, I think this is the best walking shoe for those with an overpronation problem. Adequate support is provided for the low arches that help to control overpronation. Another good thing is that you can wear these casual shoes on a daily basis, as well as on occasional adventures. Shaft sizes measure 2.4 inches from the arch which loads up the supportive nature of the shoes. Shoes upper design alternates between full-grain leather or velvety nubuck leather for durability and comfort at the same time. On the inside is a moisture-wicking fabric lining alongside a sock liner that you can remove at your own convenience. Dynamic gooey fluids are placed inside the forefoot and heel to further enhance the midsole shock absorption as well as a stable cushy feel. Despite their apparent good performance, it is possible to get a knock off on your purchase. Opinions vary on quality, with some users complaining of feeling pain when having these shoes on. The sizing chart is a nightmare to figure out the exact shoe size. First of all, I don’t know whether it’s the durable double-stitched canvas material or the tons of sizes and color that is more impressive about these shoes. In addition, it’s actually a unisex type of shoe, meaning that you and your partner could share the same amazing experience in these shoes. Featuring a classic low-top lace-up style and an original waffle outsole, the Vans Unisex is a shoe brand that definitely fits right into your wardrobe. A padded collar makes for more comfortable walking shoes. Its stylish laid-back feel and look radiate a sense of style. Weighing just about 12 ounces, fatigue is one thing you shouldn’t be worried about. Shoe shaft measures about 2” from the arch, enhancing the wearer’s comfort. Since it is a lace up type of shoe, you have to tie them up once in a while. Since these shoes are unisex, sizing them for men is hard at times. Male buyers often confuse women’s sizes to be for male. You need to take extra care to end up with the right pair. The price can be a hindrance to some buyers as well. When picking the best walking shoes for travel, it is important to consider comfort before anything else. Yes, you might want a stylish one, but don’t get me wrong. You wouldn’t want to be limping in the streets of Milan Italy in the most stylish shoes you could find. All in all, there are other factors that you need to consider when picking the best shoes. As you already know, you need to pack as much as possible, but without having a too heavy luggage. If you noticed, I settled on some of the most lightweight shoes currently available on the market so that you don’t have an excessively heavy luggage. Lightweight shoes also put less strain on your legs. Trust me, they may be stylish, but if they are heavy, then your legs will pay the ultimate price. And let’s face it since all you plan on doing is walking, comfort is paramount. For the most comfortable walking shoes, you don’t need too much cushioning. Unless you plan on throwing in some jogging/running while you are at it. Look for shoes that if you twist upwards offer little to moderate resistance to bending. The best test for comfort would be to try on the actual pair of shoes and feel how it supports various parts of your feet. Wriggle your toes a bit to test for toe freedom. Cramped up toes are every walker’s nightmare. Your traveling destination plays a key role in the choice of walking shoes to travel with. Are you going to the United States, Southeast Asia, Europe, or Antarctica? After determining your destination, settle on the ideal shoe style. For example, most people in Southeast Asia prefer flip-flops, so you might want to consider those. On the other hand, Europeans pay more attention to style and comfort. Carry out some research on your destination then settle one that matches. You might have the most comfortable flip flops, but if you get caught in a slippery path after a storm, they wouldn’t be as comfy as before. If the destination is a hot and dry one, then pick highly breathable and lightweight shoes, preferable sandals. In case you have headed to somewhere wet and cold, pick a pair of shoes with waterproofing capabilities. A good option would be a trail running shoe. Rubber soles would be a good idea for excellent traction in slippery conditions. Different people have varying traveling styles. While others go the casual way, others are stricter with their style. It is the former that has more varieties of shoes to choose from. Alternatively, if you are the traveler who prefers nature/dirt roads, then go for light hiker shoes. Another key consideration to make is whether you use orthopedics or not. If you do, then your shoe choice needs to accommodate these slip in saviors. I have included a couple of options that may come in handy for this purpose. As you set out to buy a new pair of walking shoes for travel, keep in mind that these shoes are almost similar in design to trail-running, multi-sport or light hiking shoes. The slight differences arise from the casual styling of walking shoes. Lightweight, comfortable, well-padded, snug fit and breathability are some of the key considerations you need to make as you pick one. In this review, I think the Easy Spirit Women’s Traveltime Mule and the Sperry Top-Sider Men’s walking shoes are the best walking shoes for travel. Opinions normally vary depending on one’s preferences. Have I left out your favorite walking shoes for travel? If I have, then kindly let me know what you think in the comments section below.